Impossibly gorgeous garden roses and a collar of leafy greens–this bouquet just feels like spring, don't you think? What's your favorite spring flower? I'm partial to lilacs and peonies, but I can't ever pass up a rose! Image by Pezz Photo, Bouquet by MMD Events. PS–I'm tickled to be featured in the lovely Lily Lemontree's Profiles in Style series, where I'm sharing all my favorite things! I adore this color and the style. Swooning. I am obsessed with garden roses. I need some of my own in my garden but they intimidate me like no other. I think I have to wait until I'm more experienced at growing/taking care of flowers! They were in my wedding bouquet so they'll ALWAYS have a soft spot in my heart!! Lilacs and peonies are tops for me, too! I could live in a garden. I love peonies too. Doesn't every woman? Ha. But roses are just so old and grand. Beautiful. I love sunflowers they are my favorite. yes, peonies are the best! I love the way this bouquet looks against that lovely dress. My boss recently attended an englishnwedding, and I've been drooling over his photos of it! Lilacs are my FAVORITE spring flower, they smell so good. Beautiful! I looove garden roses. Peonies through and through! Can't get enough of 'em! Man, how much more do I adore you after reading that delightful interview? Also, peonies, obviously. I'm so cliché. 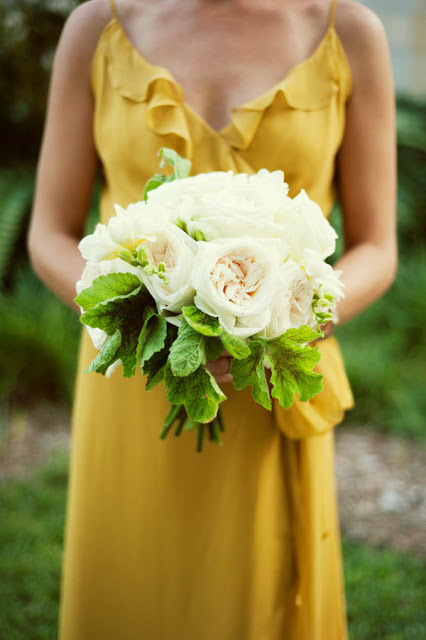 Love peonies & also loving that yellow dress! My love affair with English gardens started long ago with The Secret Garden. Goodness, if I could live in a place like that I don't think I could ever live anywhere else. the mustard yellow is just fantastic. whoa. I have actually started to love garden & cabbage roses over peonies...gorgeous!!! I love english roses--like light pink and white are to die for. Just playing catch up! I love the ruffle on the neck; it looks so pretty without being overly feminine. I think I need a blouse like that..